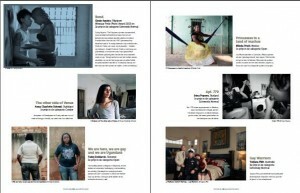 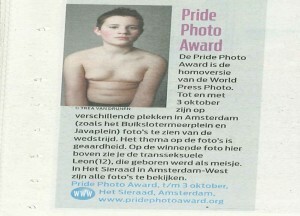 Browse this page to read articles about Pride Photo Award that have appeared in newspapers and magazines. 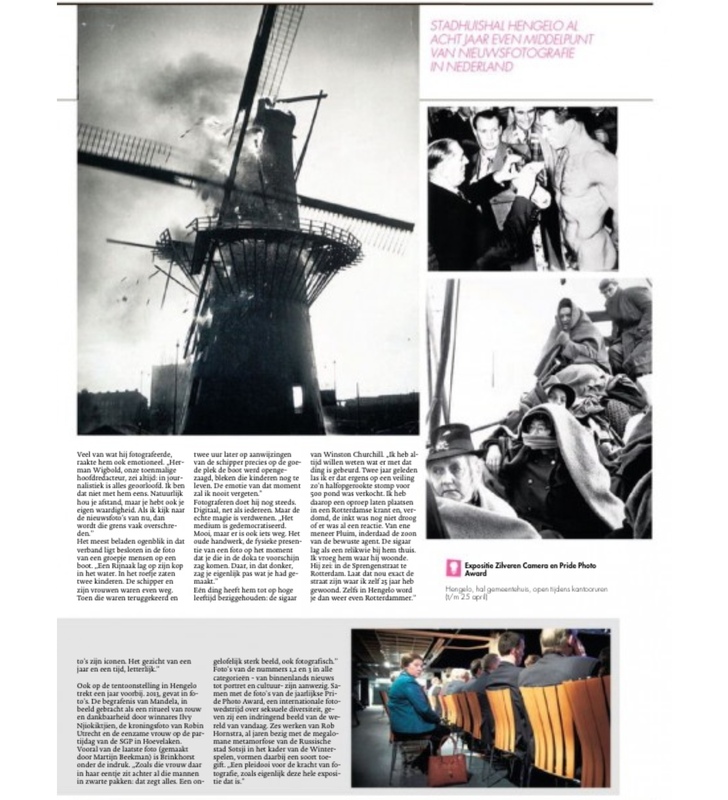 It also contains links to audio and video files of interviews that were broadcast on radio and television. 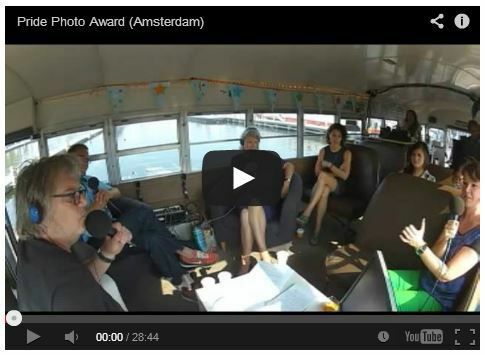 Most of television coverage is also linked on our Youtube channel. 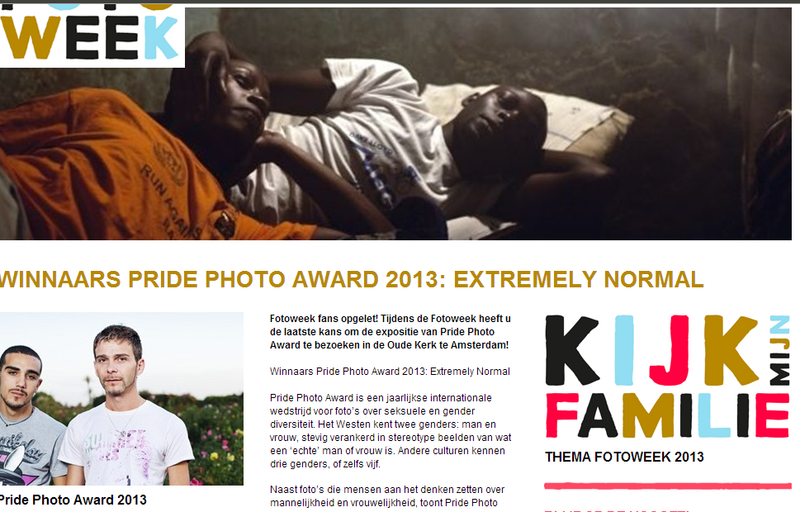 In some cases we link to other websites that have written about Pride Photo Award. 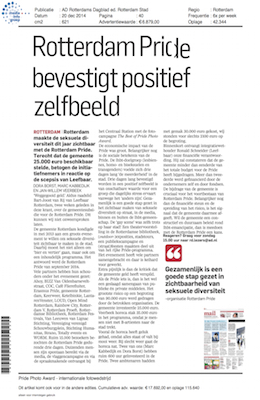 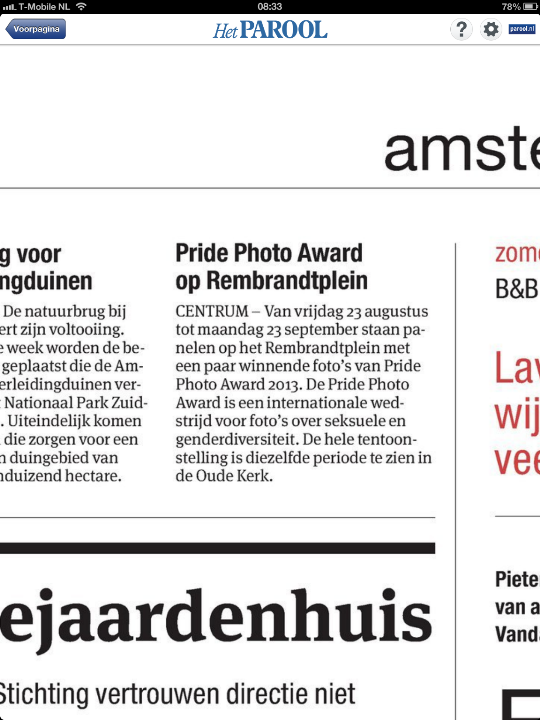 AD Rotterdams Dagblad about the outdoor photo exhibition in Rotterdam. 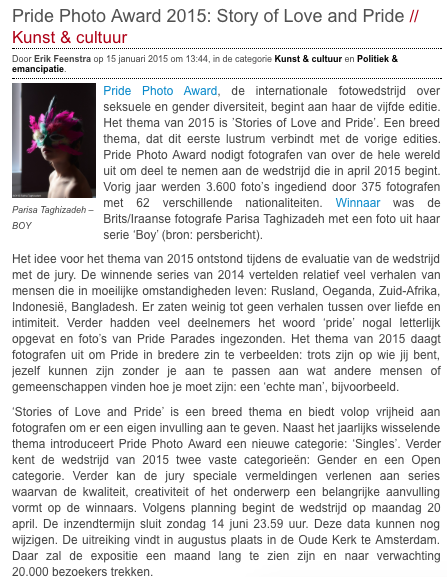 Et Alors Magazine covers the winners of the 2014 Pride Photo Award exhibition from page 54. 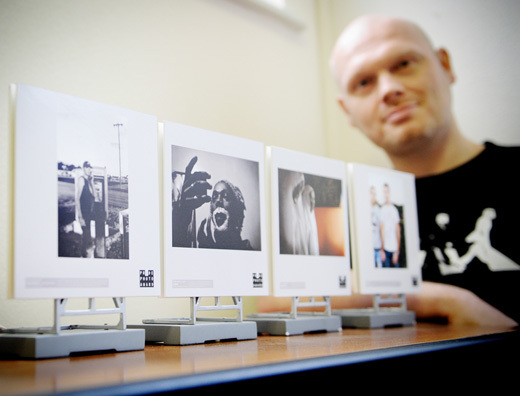 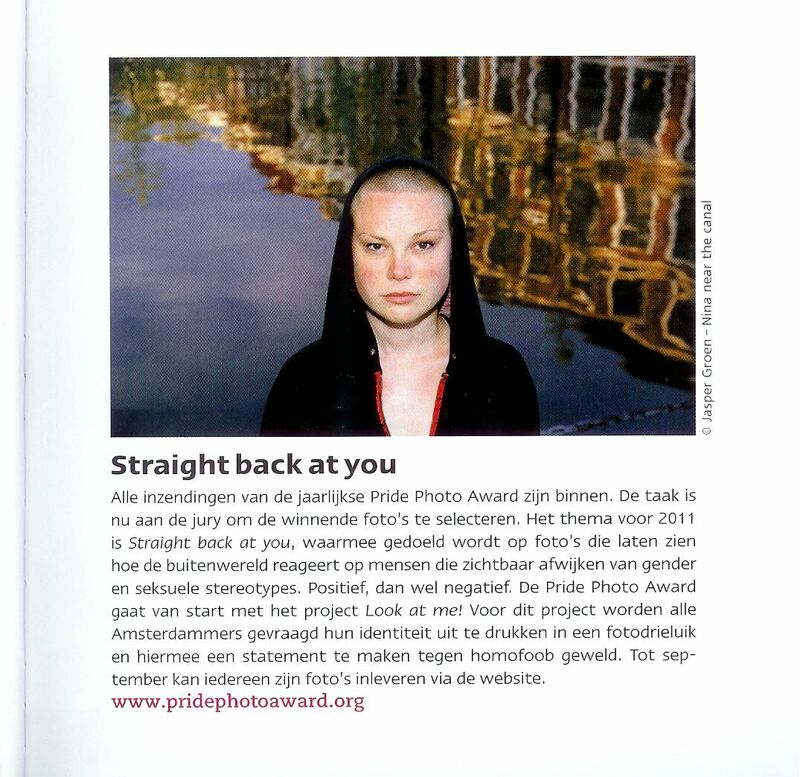 Article about the record number attendants at the Pride Photo Award 2014 exhibition. 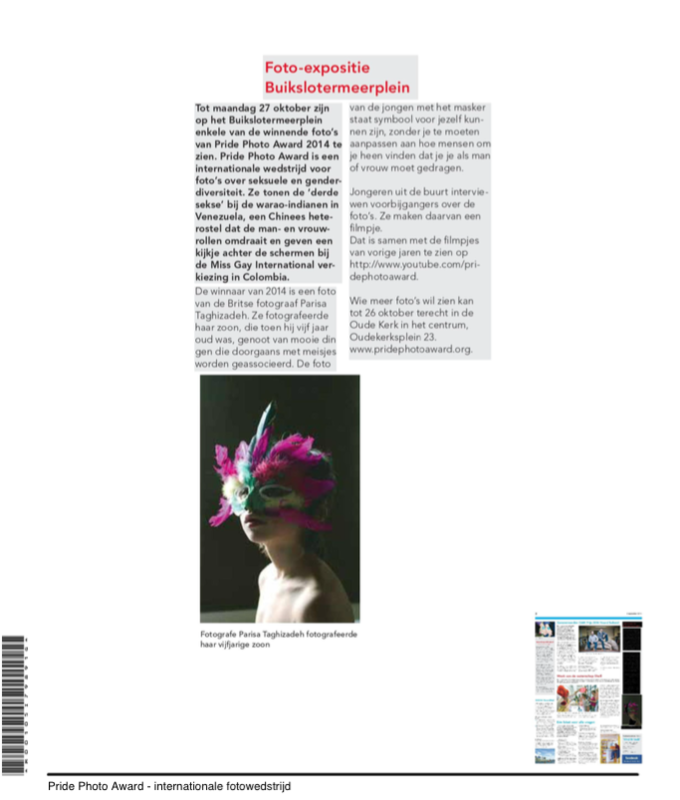 Article about the Let Them Show Their Faces exhibition in the PhBroking gallery in Modena, Italy. 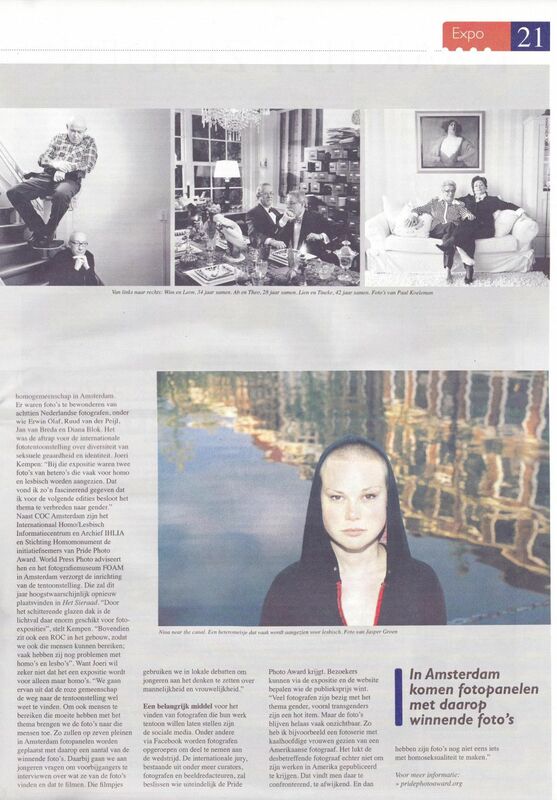 AT5 shows footage from exhibition in Amsterdam. Pownews show footage of the photo exhibition at Mercatorplein in Amsterdam. 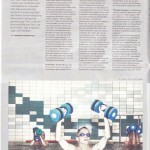 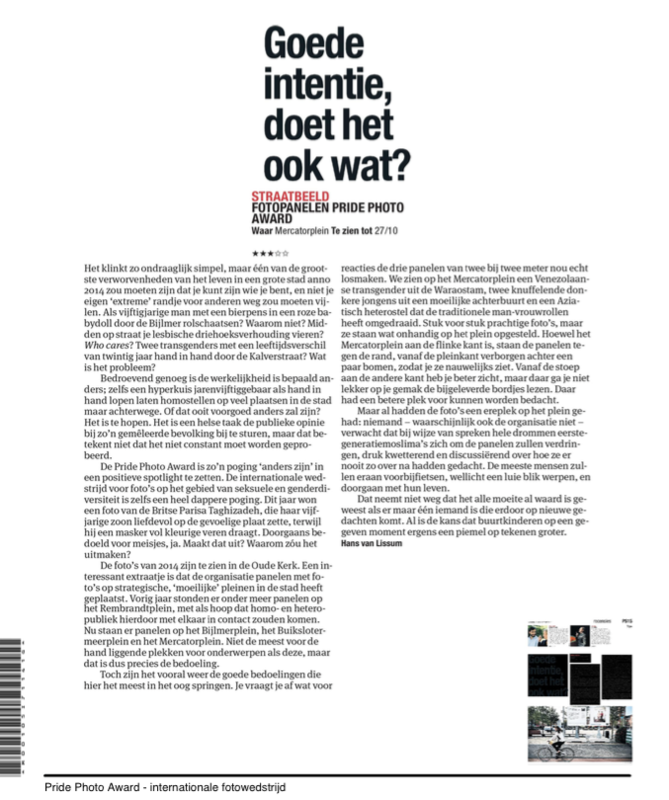 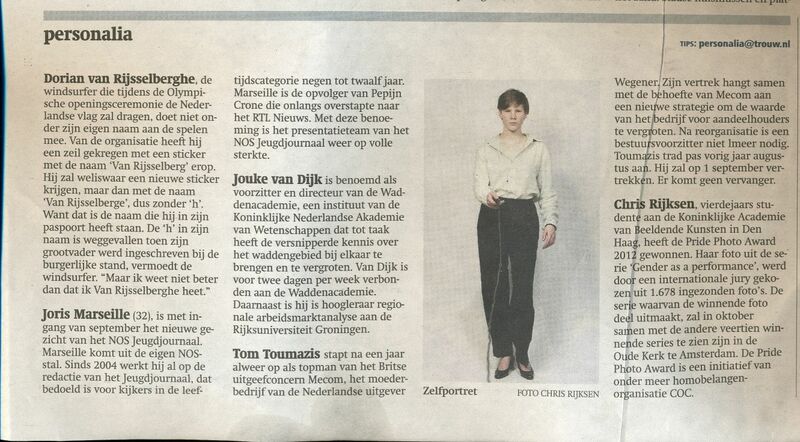 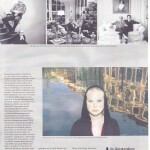 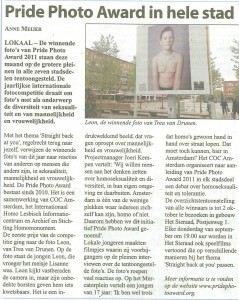 A piece out of Parool where they discuss the photo exhibition at Mercatorplein in Amsterdam. 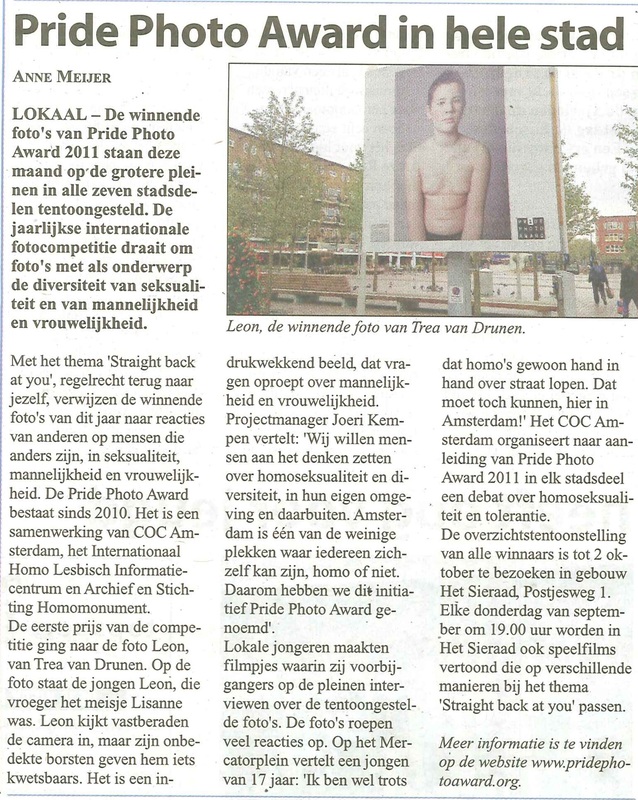 Article from Noord-Amsterdams Nieuwsblad about the photo exhibition at Buikslotermeerplein in Amsterdam. 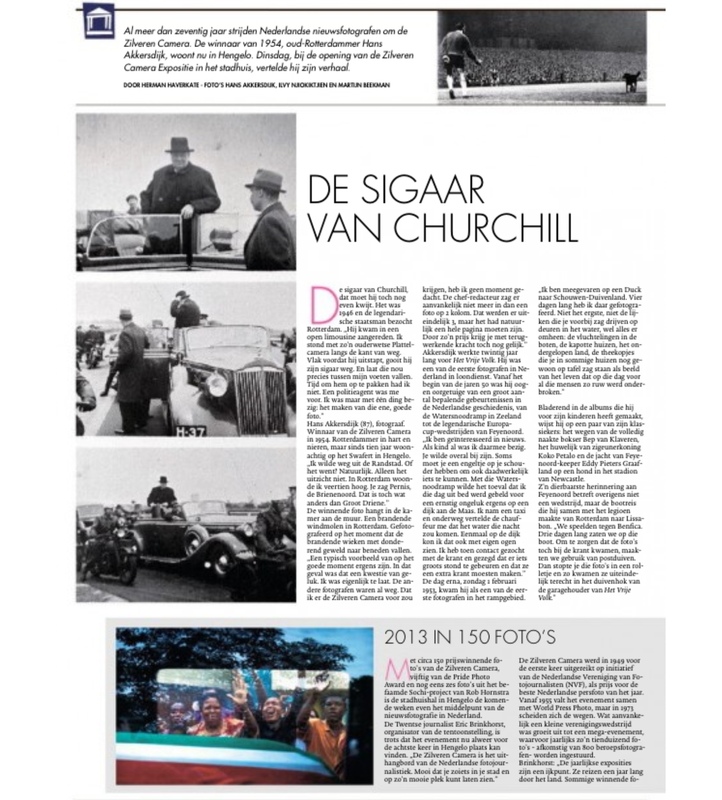 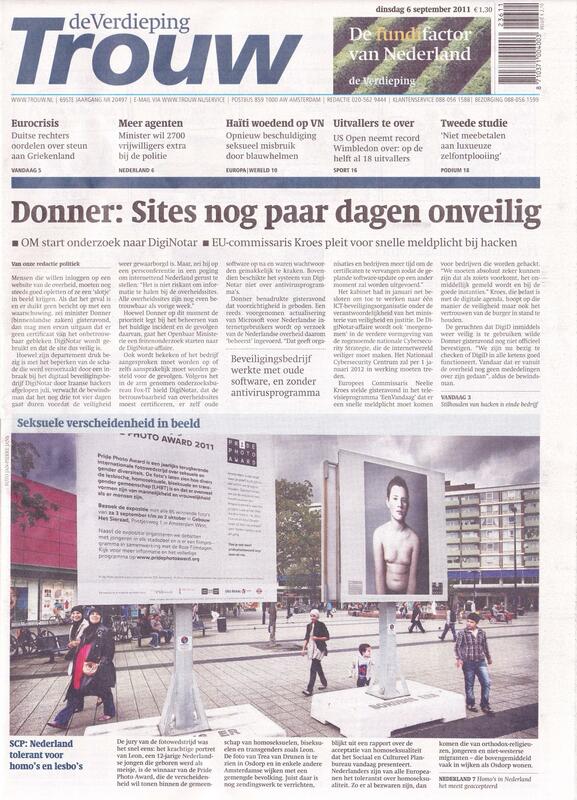 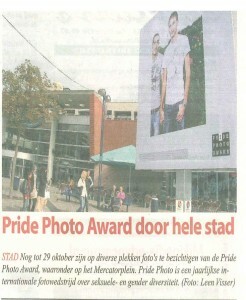 Article about the photo panels which were placed at the Mercatorplein in Amsterdam. 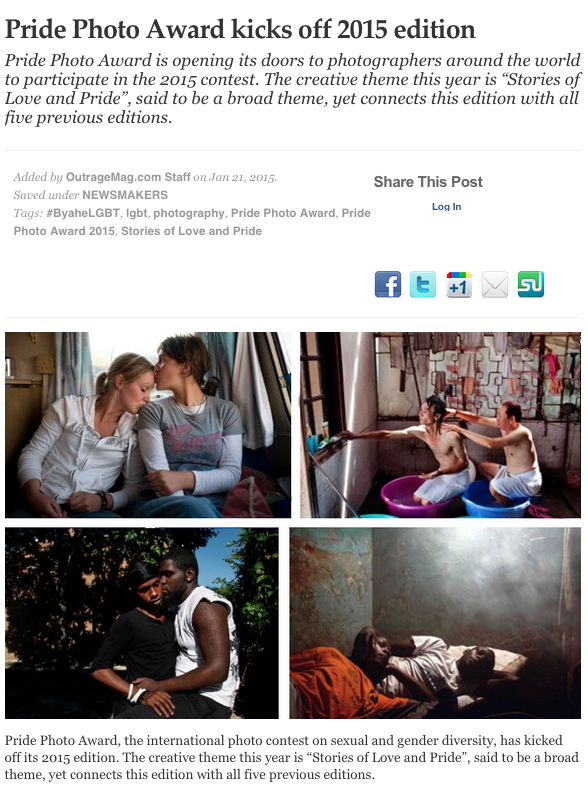 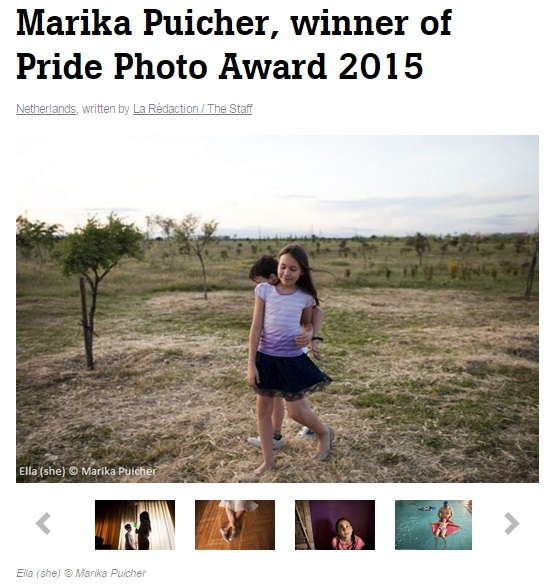 Article in the Italian Huffingtonpost about the 2014 Pride Photo Award contest and the winners. 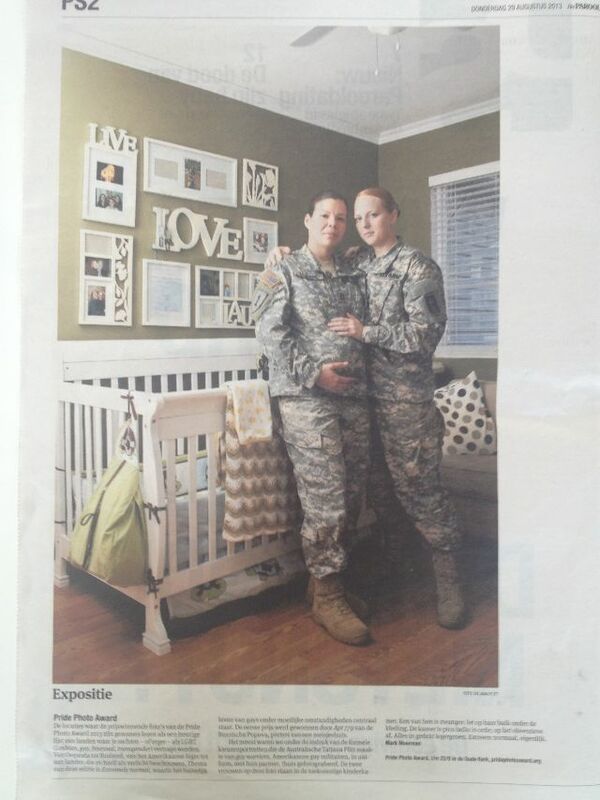 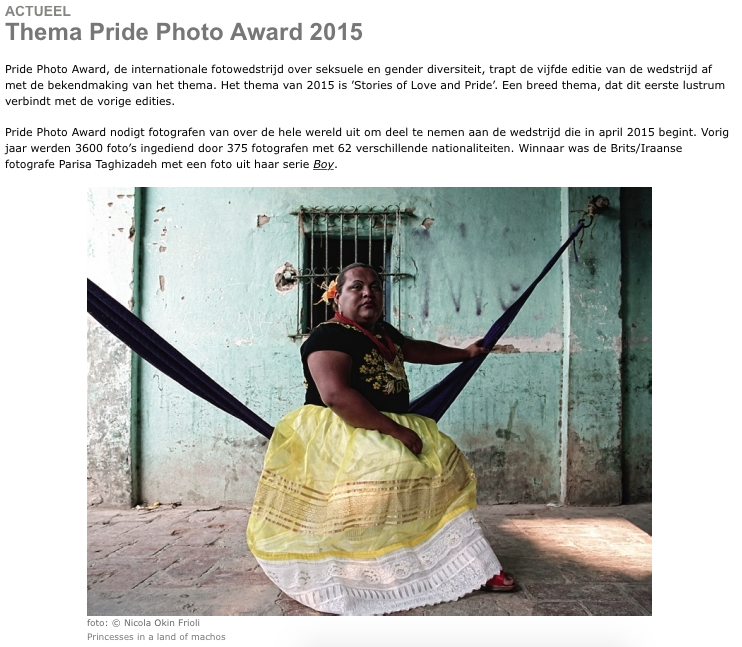 Article about the 2014 Pride Photo Award contest and the winners. 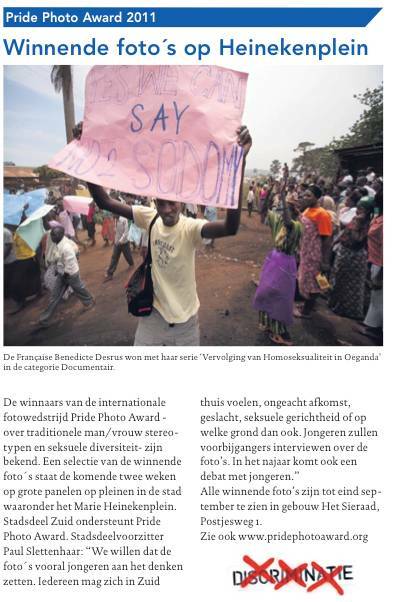 Article naming the winners of the Pride Photo Award 2014 contest (article in French). 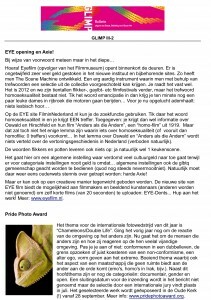 Article with a slideshow of pictures of entrants (article in Dutch). 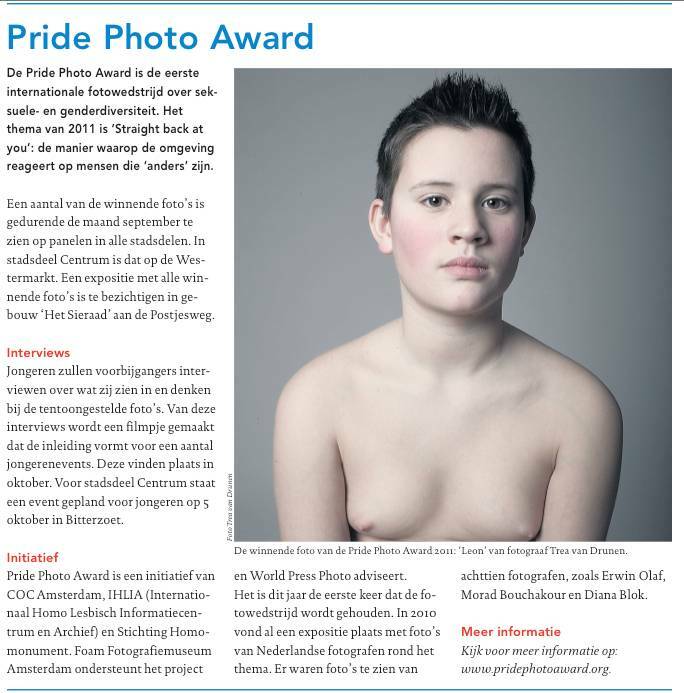 Record submission Pride Photo Award 2014. 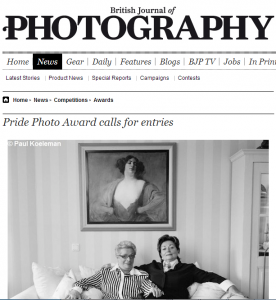 Call for entries Pride Photo Award 2014 (article available in English, German and French). 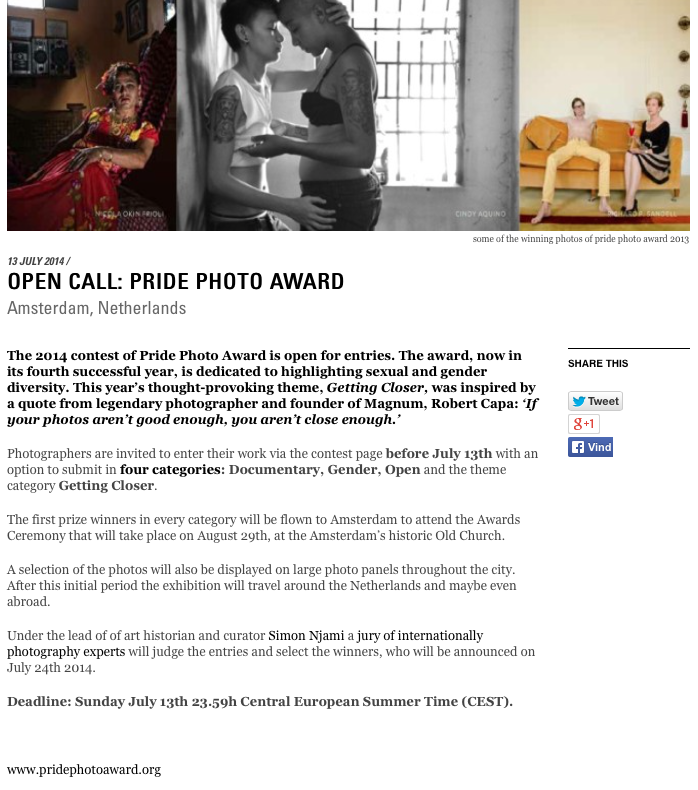 Call for entries Pride Photo Award 2014 in Argentina (article in Spanish). 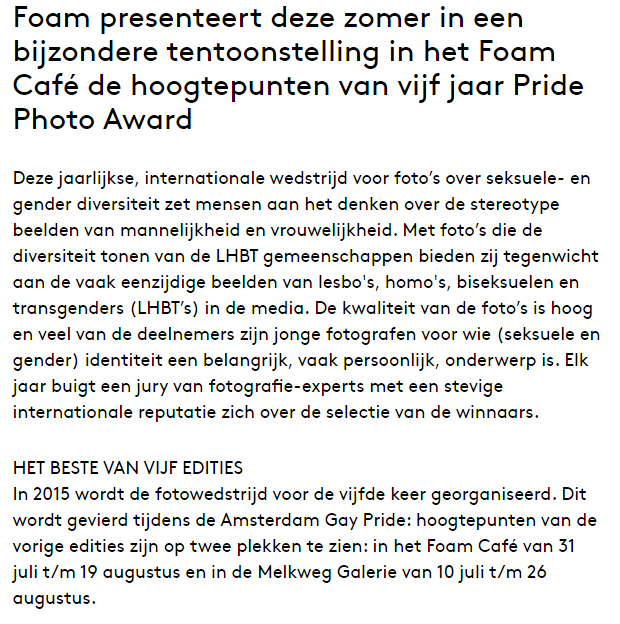 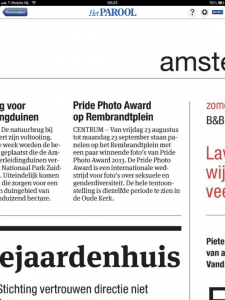 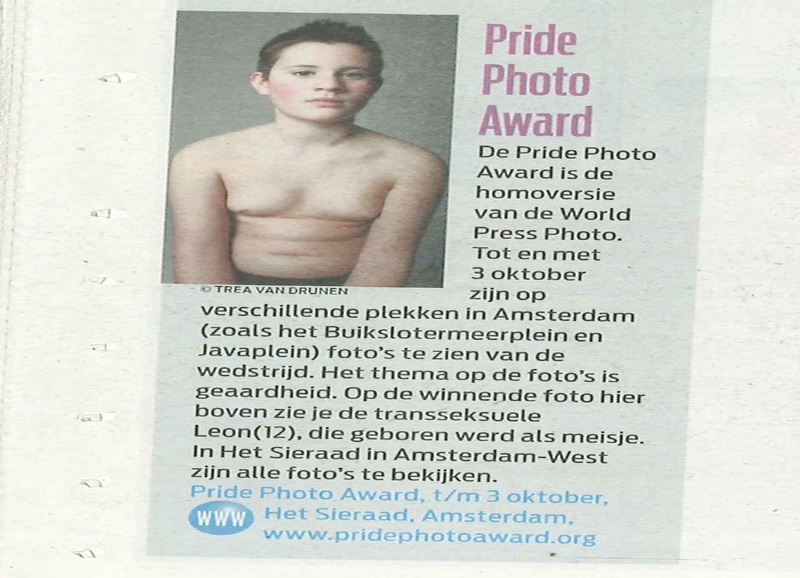 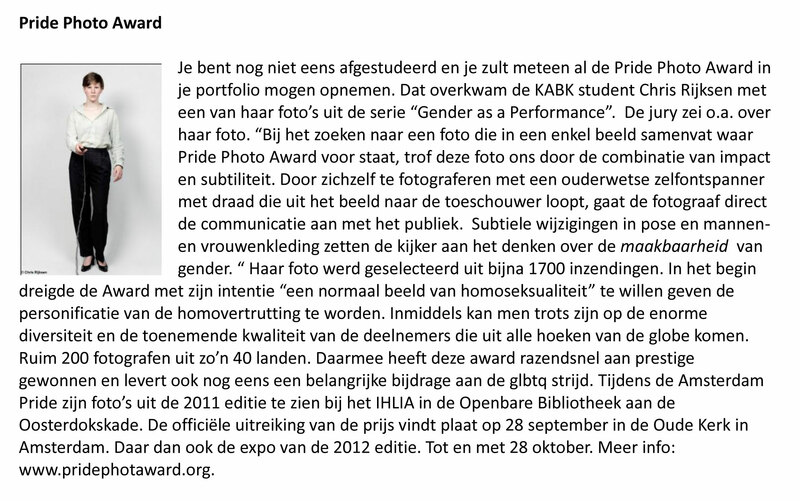 Contest Pride Photo Award 2014 opened (article in Dutch). Call for entries Pride Photo Award 2014 (article in English and Chinese). 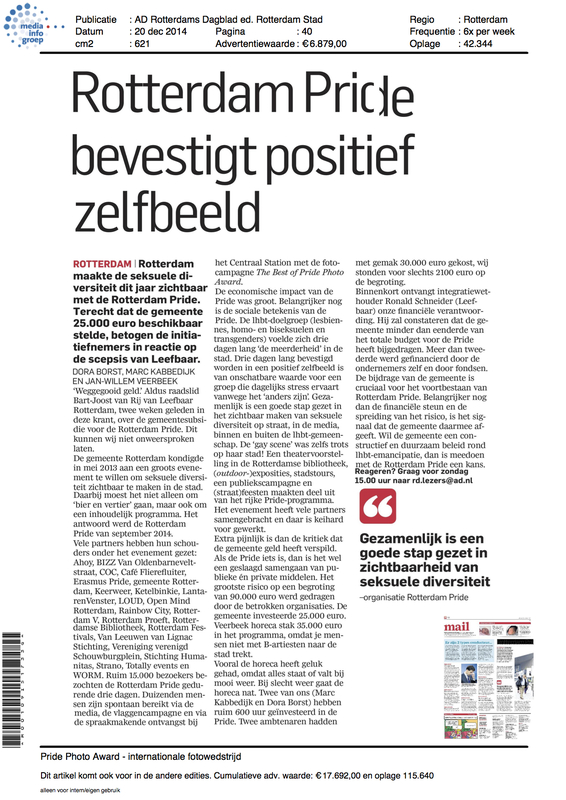 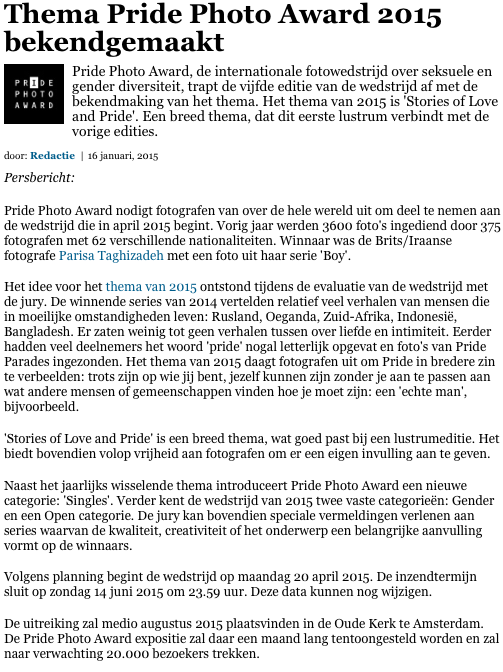 Article announcing the start of the Pride Photo Award 2014 competition (article in Dutch). 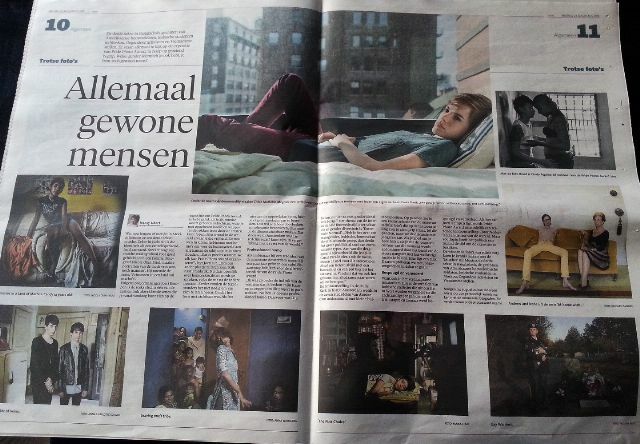 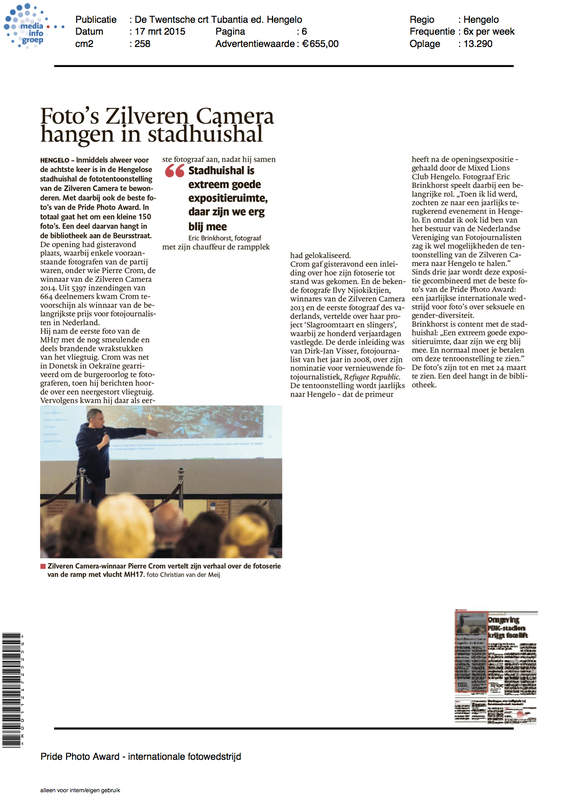 Article from Tubantia Newspaper about the Zilveren Camera exhibition in Hengelo. 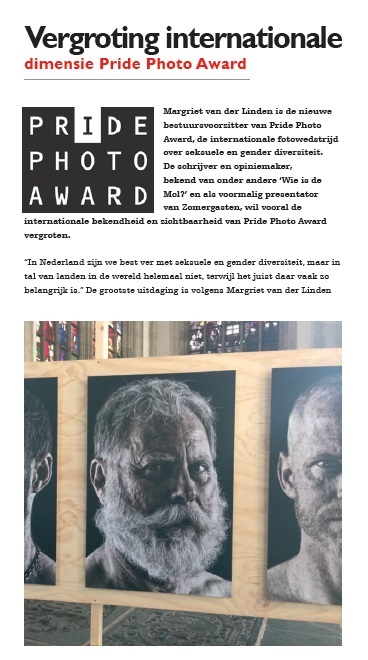 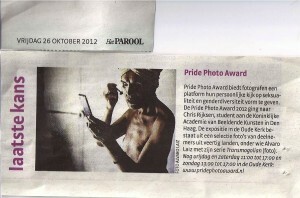 The insert mentions Pride Photo Award (article in Dutch). 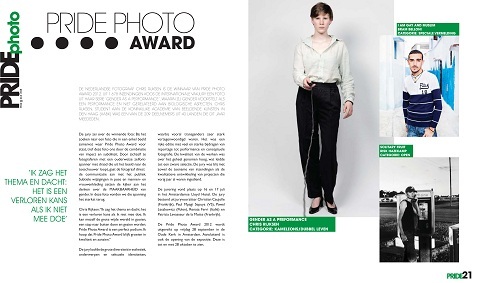 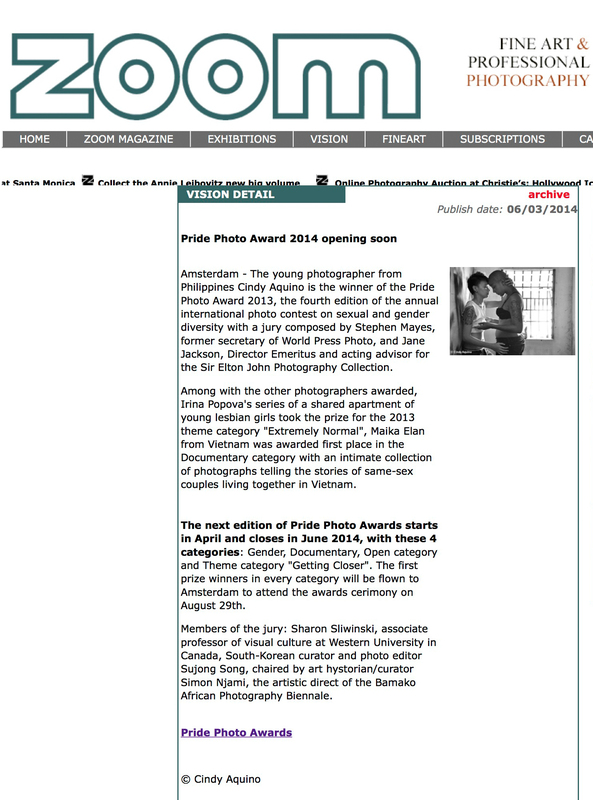 Article from ZOOM-net.com about the opening of the 2014 Pride Photo Award edition. 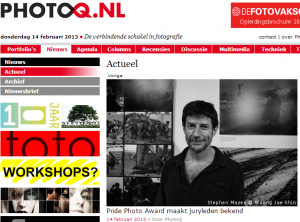 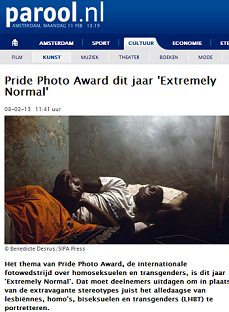 A webpage dedicated to Pride Photo Award’s exhibition of the winning photo’s of 2013 (in Dutch). 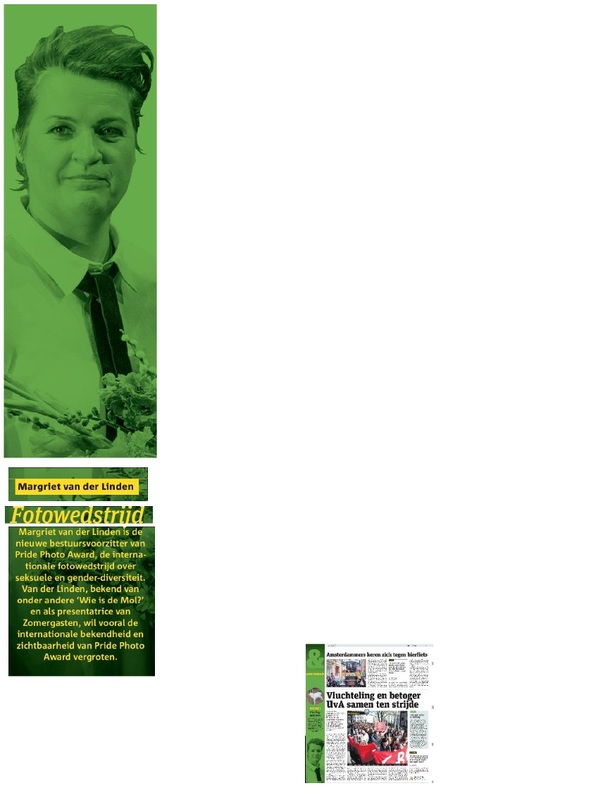 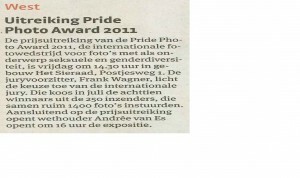 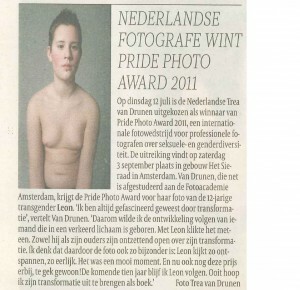 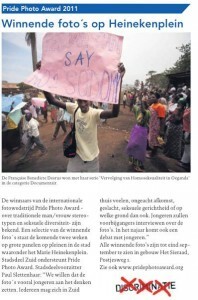 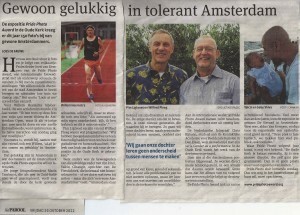 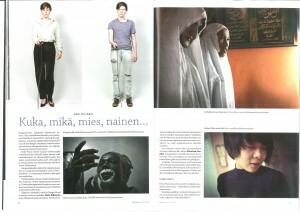 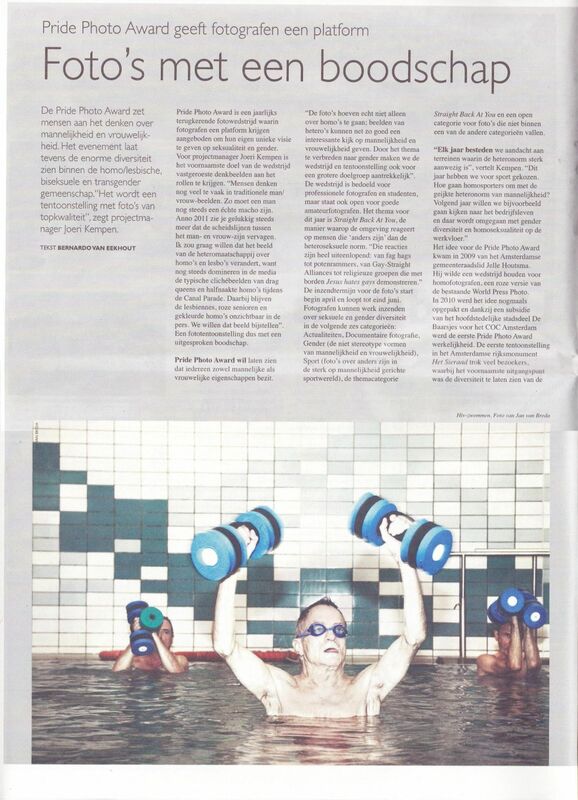 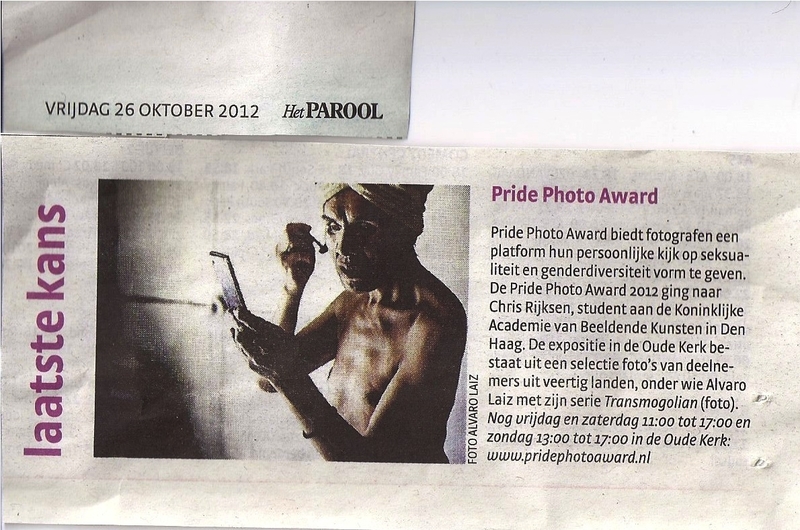 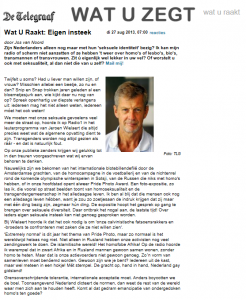 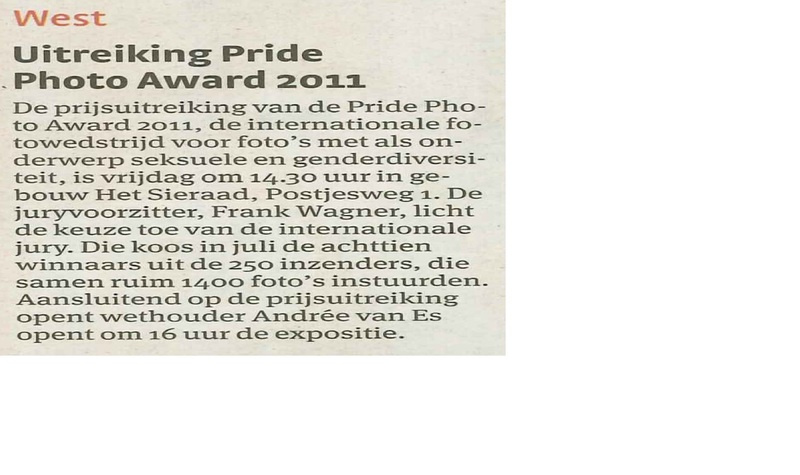 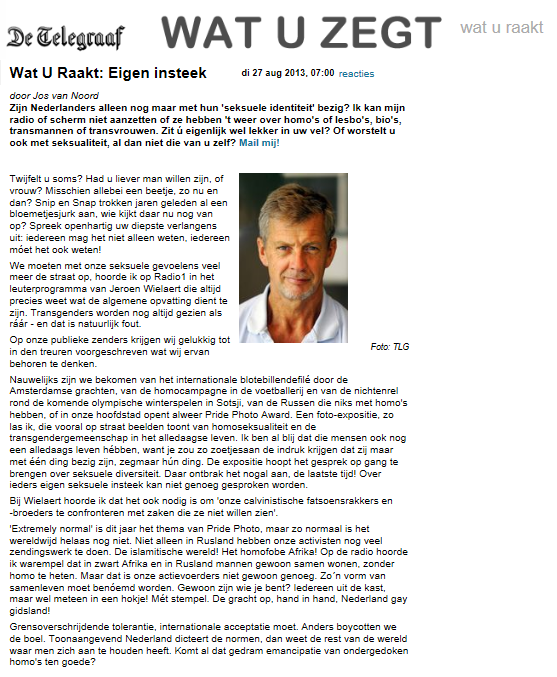 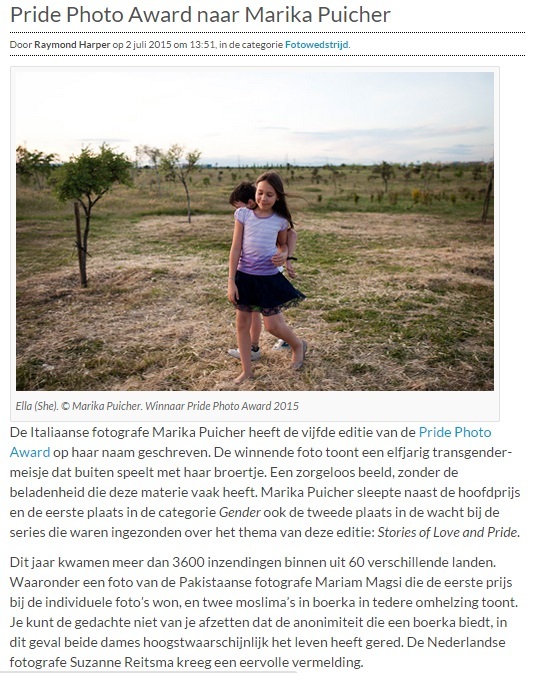 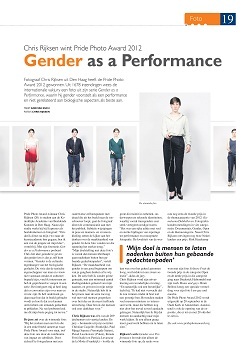 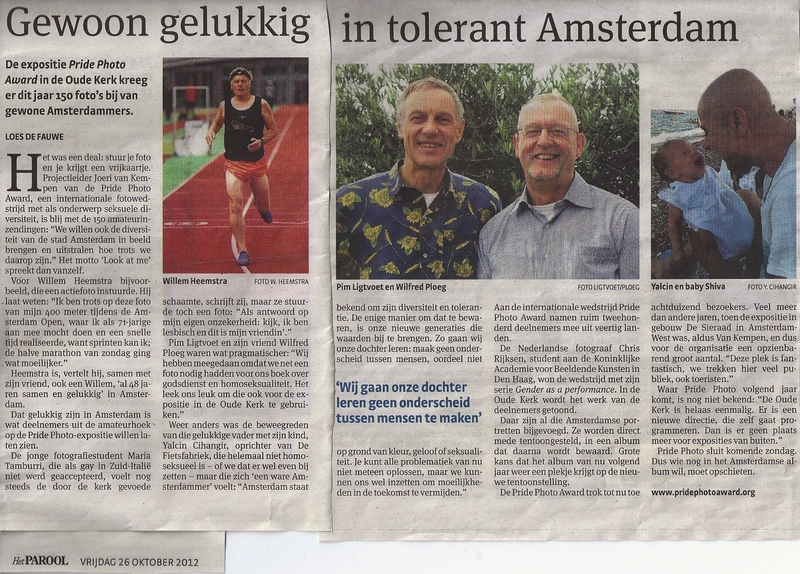 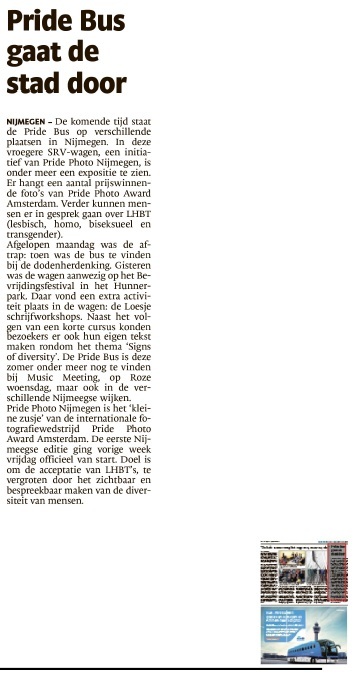 Article about the winner of the Pride Photo Award 2012 (article in Dutch). 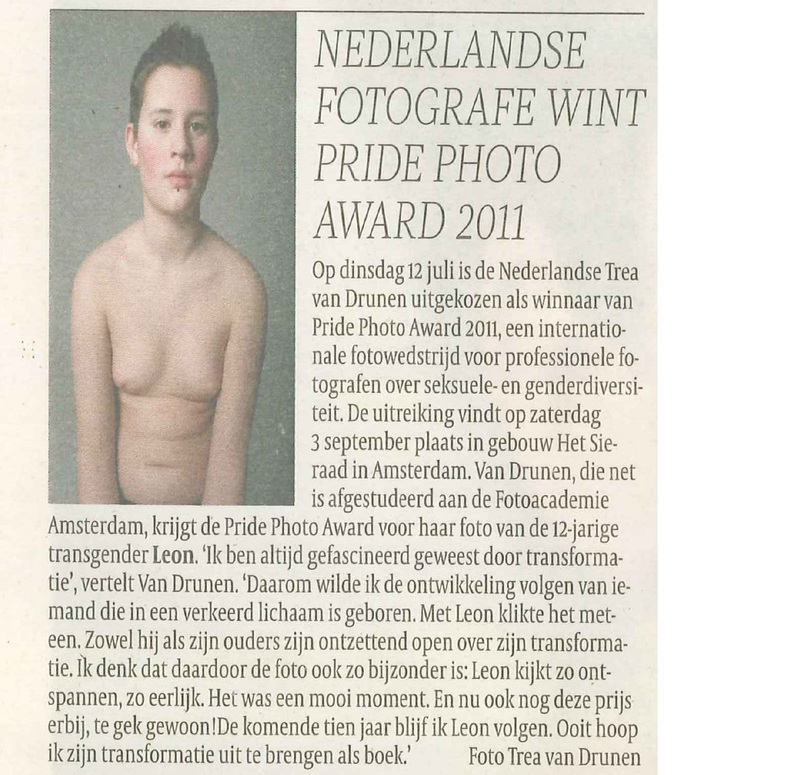 Article about the winner of the Pride Photo Award 2012 (article in Dutch). 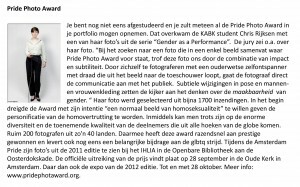 Click on the image to read the text. 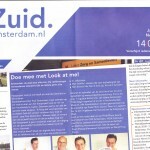 Amsterdam FM, radio interview about Look at me! 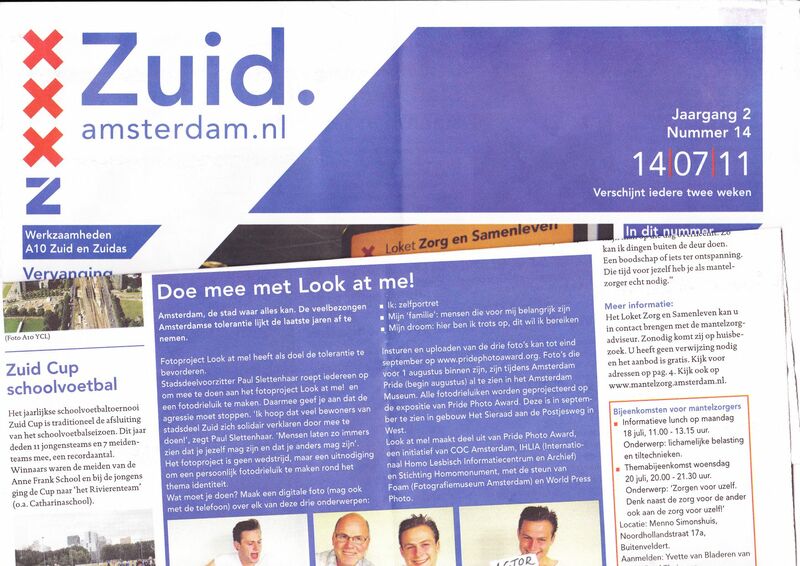 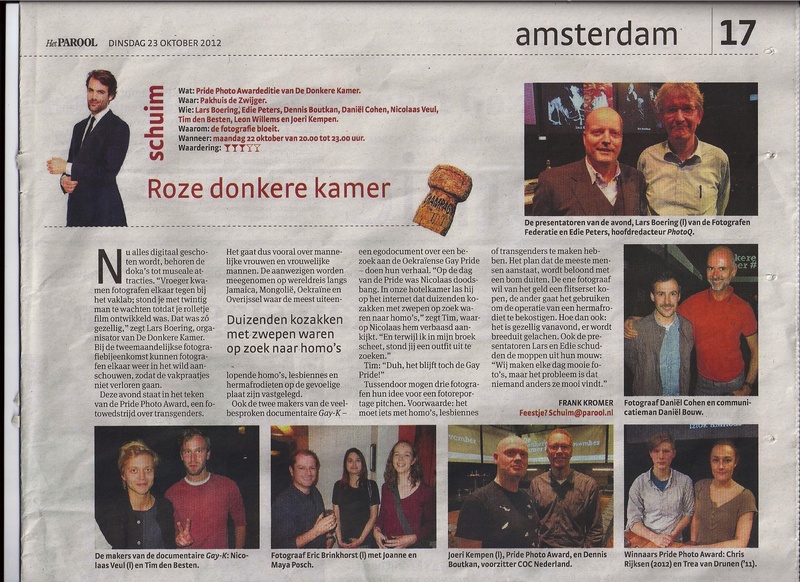 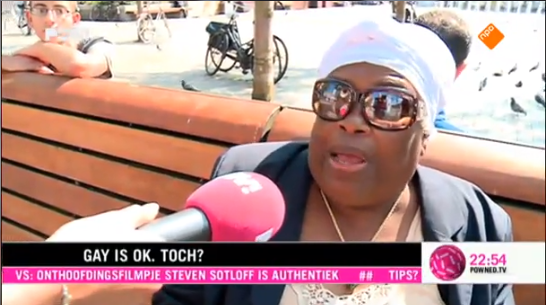 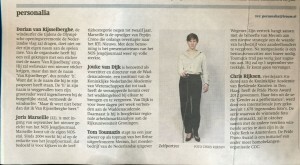 2011-07-14 SD Krant Zuid; Look At Me!